Majora’s Mask is set in the land of Termina, a mysterious place that is remarkably similar to Hyrule in some aspects, but vastly different in others. As we are told in the Instruction Manual for Majora’s Mask, it is a parallel world of sorts, sharing almost identical inhabitants and locations. Perhaps the most important difference between them is their “guardians”. As we are told in Ocarina of Time, Hyrule was created by the the three Golden Goddesses: Din, Nayru, and Farore. When they left the world they created, a sacred artifact containing their Essences remained: the Triforce. The inhabitants of Termina however, follow and worship the Four Giants who protect their land. Both lands are independent of each other with no knowledge of the other land’s “Gods”…or are they? Goddess of Time, help us please! This quote comes on the Night of the Third Day when you meet the Skull Kid on top of the Clock Tower. Tatl cries for help because the moon is very close to plummeting into Termina, bringing about its doom. While exactly who the “Goddess of Time” is may be debatable, it’s interesting to note that the Goddess of Time is also mentioned by Princess Zelda in a flashback scene. The fact that people from both Hyrule and Termina know of the existence of the Goddess of Time would seem to imply that it’s the same Goddess. If Termina had its own separate set of Goddesses, and its own separate Triforce to match, then it’s likely more would be known of them. Yet it seems that the vast majority of Termina does not know or worship the Goddesses. One could logically conclude that at some point knowledge of the “Goddess of Time” and perhaps the other Goddesses of Hyrule reached Termina. The possibility of Terminian knowledge of Hyrule deities is furthered by the fact that the Triforce symbol appears in Termina. On the path leading to Ikana Canyon, there are pillars aligned on either side with strange gargoyle-esque creatures shown licking the Triforce. 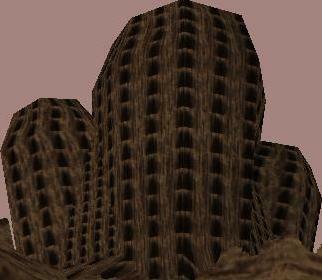 The Stone Tower of Ikana also features blocks with these same depictions. 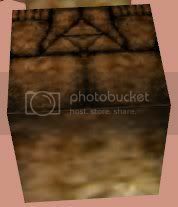 The fact that the Triforce symbol appears no where else in the game except in an apparent state of defilement has led to various theories concerning what intentions the builders of the Stone Tower had. In order to answer the first question, we have to know who has been to both Termina and Hyrule. From what we can tell, there are only three people who have been confirmed to have spent time in both Hyrule and Termina. They are Link, the Happy Mask Salesman, and the Skull Kid. It’s possible that others have been to both, but only those three have been confirmed. Link himself could not have been the one to have brought knowledge of the Goddesses and the Triforce to Termina, because the pillars depicting the Triforce have been there for a long time prior to him discovering Termina. 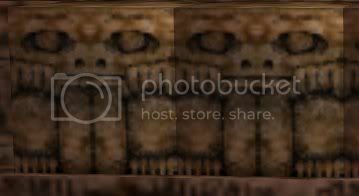 The Happy Mask Salesman has been to both, but we can’t say for certain if he had been in Termina prior to the game of Majora’s Mask. He is not referenced by anyone in the land, so there is no way to know if he has been there previously. The only person who is confirmed to have been around at a time before the Triforce pillars and blocks were made is the Skull Kid. He clearly has an extensive history in Termina, as he is mentioned in a story told by Anju’s grandmother, to have happened long ago. four worlds like they are now. The introduction of this tale lets us know that it’s already an ancient piece of Termina history. The people had not yet separated and gone to live in different places. Everyone lived in Clock Town, and the Giants lived with them. This predates the building of the temples outside of Clock Tower Town. Here is where the Skull Kid comes into the story. Throughout the game, he is repeatedly called an imp by various people who he has wronged. This title is not given to anyone else in the game, so we can safely assume it’s referring to the Skull Kid. The Skull Kid has now been confirmed to have been to both Hyrule and Termina, to have existed in Termina before the building of the temples, and to have become a friend to Tatl, who knows of the existence of the Goddess of Time. These are all indicators that he could have brought knowledge of the Goddesses and the Triforce to Termina, but perhaps the most interesting indicator is the rest of the story told by Anju’s Grandmother. Repeatedly, he wronged all people. “You have caused the people pain. Oh, imp, leave these four worlds! saddened. He had lost his old friends. When the Giants left, Skull Kid felt abandoned and from that point on “repeatedly, he wronged all people”. When threatened by the Giants because of his ways, we are told he returned to the heavens. Where exactly did Skull Kid reside between the time he was banished and when he found Majora’s Mask? The land of Hyrule. Two points of interest arise here, the first being that it says he “returned”. Wherever it was that he went, it appears it was not his first time there. This supports the idea that he had found Hyrule and possibly knowledge of the Goddesses prior to the Giants leaving. Secondly, he returned “to the heavens”. What exactly does the story mean when it refers to Hyrule as the heavens? Is this a literal heaven, or does it just mean the skies? The original Japanese gives us some insight, as the word used for “the heavens” more accurately translates to “the realm of gods”. Thus, when banished from Hyrule, Skull Kid return to the realm of the gods, or goddesses in this case. This creates a sense of irony, for a few short lines after the Imp returned to the heavens, we are told that the people in turn worshiped the Giants like gods. If Skull Kid was indeed associated with the Goddesses and the Triforce in the minds of the people, it could explain their seemingly negative depictions of the Triforce. The conclusion could be reached that fueled by hatred towards this Imp who had repeatedly wronged them, resentment at the thought of a place higher than their own, and disdain at the thought of Goddesses more powerful than their Giants, the people constructed the Stone Tower. They chose to honor the ‘gods’ of their land over the Goddesses of the Imp.